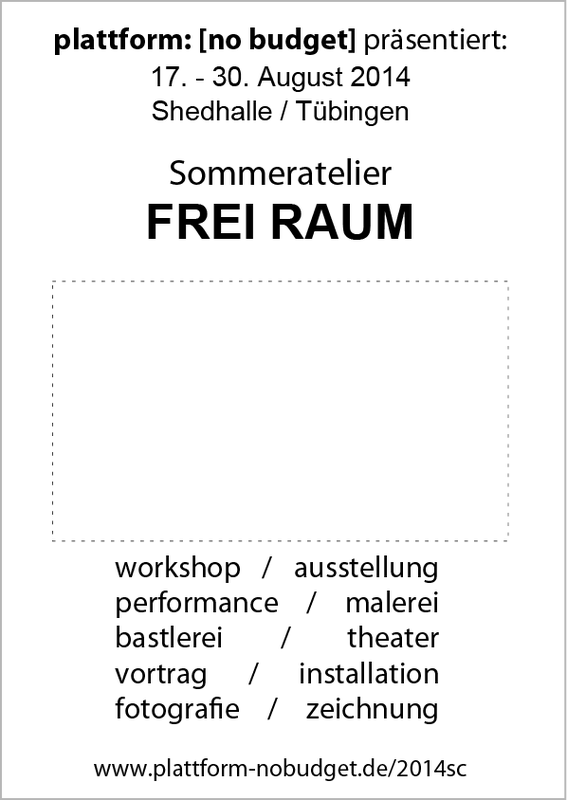 From August 17th to August 30th 2014 people fom various european countries interested in or doing Art will gather in the Shedhalle at the former Slaughterhouse for creative Planning, Exchange, and Invention of visual, auditive, haptic and other forms of Expression. In most of the Afternoons the Artists Workspace will be open to the Public. The Visitors are invited to observe the creative Process during those two weeks and take Part in it by their Presence, Stimulations and Conversations during those two Weeks. Apart from cool and hot Drinks and daily Exhibitions, public Workshops, Screenings of Short Films, Lectures and Discussions will take place at the Summer Art Camp. Saturday, August 22nd, a Festival-Party is planned in Honor of the Artist - where everyone is invited to join. In the Afternoons we further like to inform the Visitors about earlier and forthcoming events by plattform:[nobudget] and discuss freely Ideas and Inspirations for future Activities. The Background of the Motto of this Years Summer Art Camp is the Building Shedhalle itself, which is at our disposal for creative work, as well as the surrounding Compound that is used in various different Ways. After the examination of temporal Aspects of Artistic Work at the last Summer Art Camp, we want to attend to spatial Questions this Year. 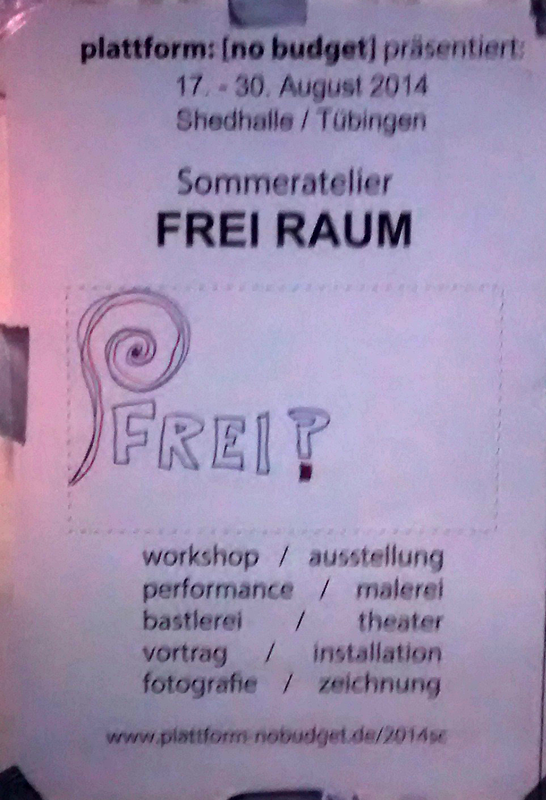 Further, we accordingly wish to engage in the Search for cultural (temporal) Utilizations of Vacancies, Spaces useable in the long term and Processes of their Opening (like the "Kommödle" and its follow-up "Kunstamt" in Tübingen). Crucial Questions are: The Impact of Freiräume / Open Spaces on the individual Artist as well as on Society as a whole; Their individual and collective Necessity, Recognition; Facilitation and Promotion of Contemporary Art; Possibilities of Interaction and Assignment beyond Art and Issues of the tenuous livelihoods of the Artist themselves. The Program with the first Workshops is online. Subscribe now or join spontaneously. Thank You for your Applications. We are hurrying to draft a Program for the Summer Art Camp. Details will be found here soon.